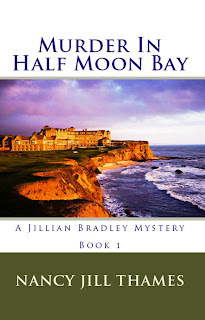 A Special Agent Comes Forth...from "Murder in Half Moon Bay"
I'll be posting a chapter from "Murder in Half Moon Bay" every day until the end of the month. Enjoy! I liked Margaret Viscuglia immediately. She was about forty years old, tall with majestically auburn hair down to her shoulders. Her hair hinted of what she’d looked like years before, and while after children her figure had grown a little matronly, she was still elegant. She welcomed me as if we had been friends for a lifetime. Quite a contrast to the chief’s personality. In fact, she was his total opposite. He had fair hair and a very nice tan. Margaret’s skin glowed pale as the moon. In her soft-spoken voice, she welcomed me into their home and went at once into their cozy kitchen to get the pie ready to serve. The chief asked me to sit down in the sunken living room reminiscent of the “sixties”. I took a seat in a swivel rocker-recliner. The perfectly-formed plushness could have put me to sleep right then and there. 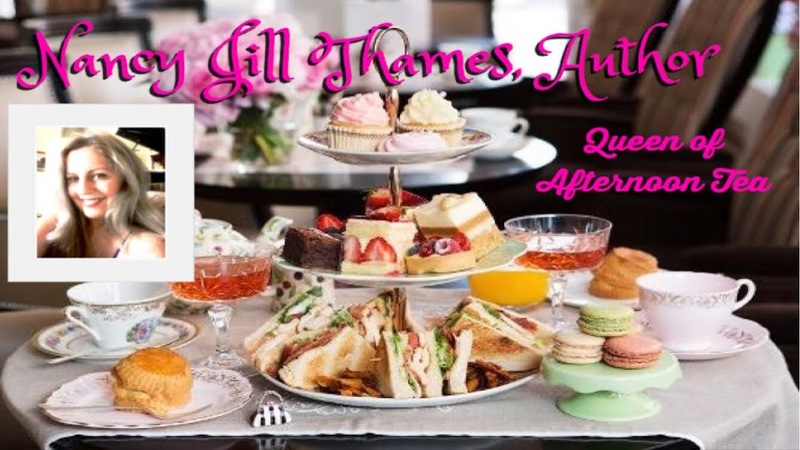 Margaret entered the room carrying a tray filled with slices of delicious looking pie and steaming mugs of coffee. “Frank says you take your coffee black, Jillian.” She handed me a plate with a piece of pie and a fork on it and a mug of coffee. I took a bite of the succulent pumpkin pie topped with real whipped cream. “Yes, I made it from fresh pumpkin. We have just a few around town in case you haven’t noticed.” She chuckled. “Jillian.” The chief broke in. “Margaret is my secret weapon for details. She sees things I would never have thought of, so while we’re having our pie, I’ve asked her to peruse the files. “I don’t mind at all, sweetheart. Would you like some more coffee?” she asked over her shoulder as she headed toward the kitchen. “I’m fine. Thanks honey.” He took the records from his briefcase and laid them on the dining room table. Margaret returned with the coffee pot and refilled my cup. I took a sip of the freshly brewed coffee and sighed, then tried to pull my thoughts together. I was tired and mad and I felt my adrenaline flowing. “The only people who would have any reason at all would be the ones who have the most to lose.” I took a bite of pie while thinking of Celeste. The chief and I both looked to where she was pointing and noticed the first phone call from Teddy’s abductor had also been from inside the hotel. “Of course.” Margaret escorted me to the door. The chief wore a concerned look on his face. He motioned for Margaret and me to move away from the door. He looked through the peephole to see who it was. He grabbed the knob slowly, so not to startle whoever was on the step, then threw open the door in a quick movement. I gasped. There, standing in the doorway was none other than Paul Youngblood and he held Teddy in his arms! Margaret invited us all back inside and got Paul a cup of coffee. We sat down while he told us what had happened. “Well, after your dog was kidnapped we knew you were in real danger, so we immediately put a tail on you in addition to the chief’s. Sorry, Chief, but I couldn’t bring you in any sooner without the risk of blowing my cover. “We had to under the circumstances. He led us to Teddy’s hiding place–an old fishing shed on an isolated pier in the bay. The chief made a call on his cell. “Deputy Cortez, I want you to arrest Lewis Ibarra on suspicion of espionage and kidnapping, and then set up a meeting at the hotel for tomorrow morning at eight o’clock sharp. “Thank you, Chief.” I was truly grateful. 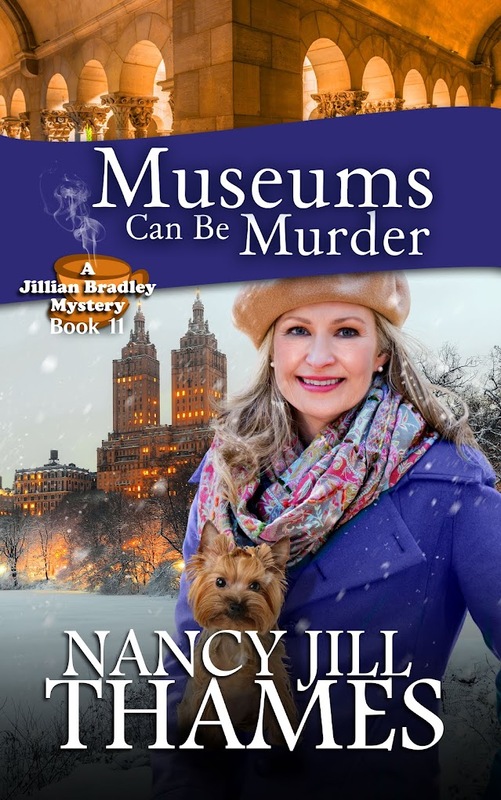 If you like to read about lovely places and fabulous cuisine, enjoy the Jillian Bradley mystery series. 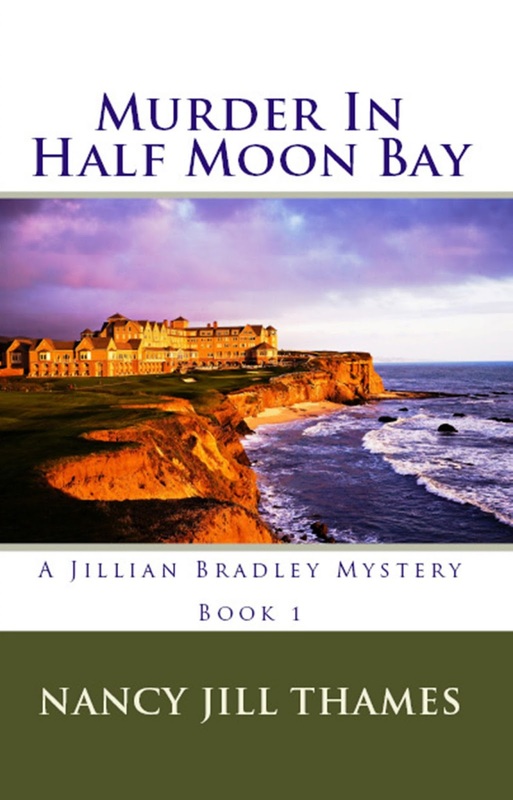 Book 1 MURDER IN HALF MOON BAY for your e-reader is free! A Slick Ruse...from "Murder in Half Moon Bay"
Two green, life-sized cardboard frogs, dressed in mariachi costumes, greeted me at the front door of the taqueria. Tiny white lights adorned the windows and Mexican music played softly as I entered. A middle-aged grandpa held the door open for me right before he left himself. I smiled and thanked him and went in. I didn’t see any of my friends yet, so I sat on the dark wooden bench near the cashier and waited. Señor Pico’s boasted bright ultramodern décor with festively painted red concrete floors. Plastic tablecloths of shocking green, stoplight yellow and bright blue covered the tables. Decoupaged chairs in the same blinding colors sat randomly around them. To put it bluntly, the place was garish–just the sort of garish one would expect to find coupled with a fiery, spice-laden cuisine. Paintings of tropical getaways hung on the walls with artificial palm trees and tropical plants rounding out the “South of the Border” theme. Families and couples sat munching and conversing at the larger tables while singles of all ages swiveled on round seats at the bar. Everyone seemed jovial and as the servers brought people their orders, my mouth began to water. The food actually looked and smelled delicious. A group moved in from the front door and I recognized my friends among them. They smiled, glad to see me already in line for a table. The server seated us and handed us tall menus decorated with parrots, cockatoos, and shade palms on some dream desert beach paradise. I was in the mood for chile rellenos. I didn’t feel jubilant enough for spice, or my favorite–juicy fish tacos. 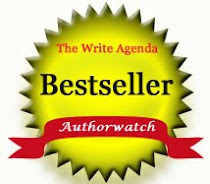 I glanced out of the corner of my eye to the back left corner of the room. I thought I recognized a young man seated alone, partially hidden by a palm tree. Deputy Cortez was in street clothes. He nodded a gesture of greeting, but didn’t attempt to come to the table and have a conversation. He must be my “tail” provided by the chief. I turned back to Ann, who started to speak. The handsome, dark-haired server placed a glass of Chardonnay before her. “And what did she say about Evelyn?” I plucked a crisp thin tortilla chip from the serving basket and popped it into my mouth. It reminded me about all the alcohol that the Westovers consumed the night of Regina’s murder. Something felt strange about the Westovers’ actions that night. The server brought a huge plate of nachos topped with jalapeños with a decorative side of salsa. I certainly needed this. The food was delicious and the overall atmosphere with the bright colors and festive music was just what I needed to relax a little. I might as well get what enjoyment I could, since I knew the ordeal of losing Teddy wasn’t over. 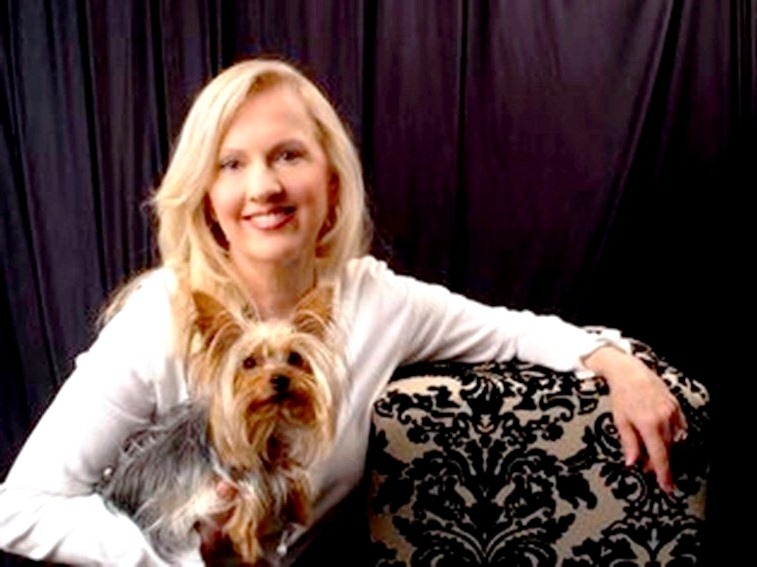 Losing my husband was extremely painful and I felt the same emptiness opening up around me again. The room began to lose a little of its color and started to fade away. I’d been there before, so I prayed. Lord, please get me Teddy back. Let me find a way. I glanced over to where Deputy Cortez had been sitting. In his place was a heavyset, foreign looking man staring back at me. My heart sank to my stomach and my stomach sank to my knees. I didn’t want to let him know I’d seen him so I smiled at Nicole and picked up a nacho, trying to remain calm. The man hadn’t ordered anything but a beer and just sat there drinking it, glancing my way occasionally. It was all I could do to choke down the food and act as if nothing was wrong. The spice and savor of my steaming dish lost its flavor. Where was Deputy Cortez? This man could be a murderer. The server brought our bill. No one seemed to suspect anything out of the ordinary. I glanced again toward the corner, but the man had disappeared. Oh, great. Now not only could he be close, I didn’t know where he was. I would just have to make sure my friends accompanied me to my car. The host thanked us for coming and offered us some thin mints in shiny green foil wrappers. I declined, feeling like I could throw up any minute. I could not face the parking lot in the dark. Fear began to get the upper hand of me. I started shaking and collapsed onto the wooden bench by the front door. I whipped out my cell phone. Nicole didn’t miss that my fingers shook as I pressed the numbers. It took me a few tries to dial correctly. I ignored her. It wasn’t nice, but I was in a panic. I had to ask, but the question caught in my throat a little. “I suppose…that’s something.” The news was bitter, not what I really hoped. “Chief, she said that his sandals looked ‘native ’so I’m wondering if there’s a connection with Dr. Nagera–he may know something. I hope nothing happens to him. “I’ll ask them right after I hang up. Now, stay put and I’ll be there soon.” He used his voice of authority. “What was that all about?” Ann, Dominique and Nicole all wore the same questioning look. Actually, they were asking good questions, questions I’d begun to wonder about myself. After all, did I really want to grieve another loss? Did I really need to sacrifice myself when Chief Viscuglia, Deputy Cortez and the forensics agents were all working so hard and using their official training to find the killer? Why did I think I was qualified anyway? I sighed, and faced them. Not just my friends, but also, the bitterest of my doubts. “Ladies, I think we need to think about patriotism here. We’ve waved flags and shouted “God Bless America” after 9-11, but are we really as patriotic as we say we are? Are we willing to sacrifice for our country? To put our personal safety, or even our lives on the line? “This may sound harsh, but I don’t think we deserve the freedoms my husband died for unless we are willing to do the same. “I think that, and I’ve always thought that. We may be just a few old busy bodies, but since we do love to get together and talk about everything and everyone under the sun, let’s use our information gathering and deductive reasoning skills to save our nation. My friends, those dear friends of so many years stared at me in that Mexican taqueria for a good minute before any of them spoke. “That’s right.” I felt a strange power now, standing in the restaurant waiting area with my friends. I wasn’t alone. I gazed out the window and I felt like no one would dare attack me right now, during this self-revealing moment. A young family left after paying their bill and lumbered to their Ford Expedition with kids in tow. The father hoisted the youngest child up and fastened him into his car seat. He couldn’t have been more than two. Wondering if maybe I had blown all of this out of proportion, my reflection came to a sudden halt. I glimpsed a dark figure moving between two cars toward the back of the lot. Just then, I saw the chief pull his car in slowly and drive through the lot to check it out. He came back to the front of the restaurant and parked in the only space left. I kept watching where I had seen the movement as the chief came through the front door, but I saw nothing else. “Jillian!” The chief sounded relieved. “Thanks for coming so quickly.” I was equally relieved that he was with us. “They probably wanted him out of the way to get to me.” I started shivering again. Two more patrol cars entered the parking lot and began searching. I gratefully handed him my keys. At the Ball...from "Murder in Half Moon Bay"
Alibis...from "Murder in Half Moon Bay"
A Man of Mystery...from "Murder in Half Moon Bay"